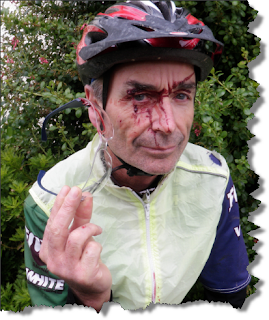 When I recommend any product for sale on my website such as the 3M Safety Eyewear for high risk activities like mountain biking, my reputation is on the line: I stand behind my products. Hence the following product test. Note: Please do not try this at home. The following test was conducted under controlled conditions by a highly skilled professional. The Test: Ride at speed down a narrow bush track, look down at your gears, gently kiss a tree, gracefully fall head first over the bike to land face first on a jagged rock. Tip from the Experts: These matters are best kept to yourself: If conscious, look around quickly to see if anybody witnessed your fall from biking grace. If not, then get quickly to your feet and pretend to be adjusting your bike seat while buckled over it with pain, just in case somebody passes by. The Results: Bloodied but no broken facial bones and eye still intact - only the perfect imprint of the 3M Eyewear, a little claret for dramatic effect, severely bruised Ego and a headache. No breakage of the glasses but left with extensive scratching - but who cares about that when the glasses are less than $20! So, into the bin and replaced by a fresh pair. 3M Safety Eyewear is a highly effective low cost way to protect the eyes and surrounding tissues from serious damage. When riding a bike, don the appropriate safety gear and look where you are going!